Greetings! 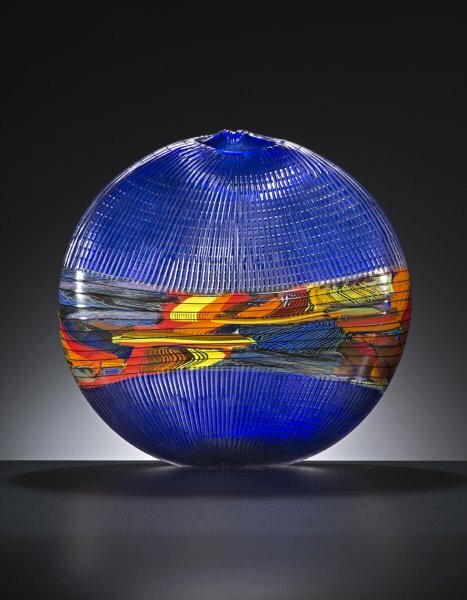 This month I am happy to be interviewing one of the glass artists that I’ve represented for so long I can’t remember when it began. 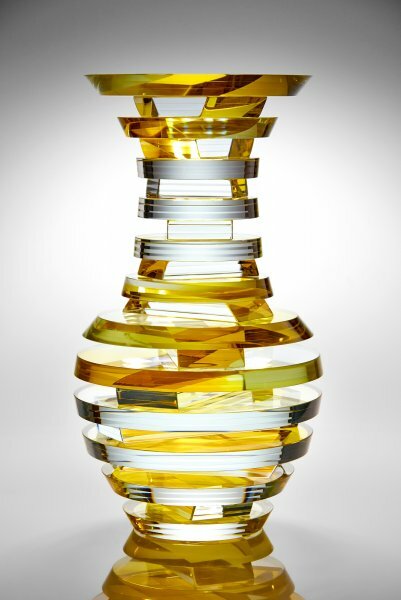 Sidney Hutter is an early pioneer in the field of cold glass work. Check out what Sid has to share with us! I also am including some outstanding works by several of my other favorite artists. Please feel free to contact me with questions or comments. "Glass is a wonderful material. Why? Because the glass is alive. Even when it is cool it is still moving. It is connected with fire, it is connected with water, it is so natural. Glass is my life." Please follow this link to see his page on my site. KH: What first drew you to work with glass and when and where did that occur? SH: I was an undergraduate student at Illinois State University and I took a crafts course as an elective. Following that, I took a course in glass making and fell in love with the material and the processes. I was working then with Joel Philip Myers who was very inspiring. At some point there was a fire in the hot shop and in order to continue working with glass I started cutting pieces of plate glass and joining them together to make objects. This is the process that I have used since 1974 when I moved to Boston to do my MFA at Massachusetts College of Art under Dan Dailey. KH: Please describe in laymen’s terms your process. SH: I cut pieces from low iron Â¼ or Â½ inch plate glass and join them using an ultra violet sensitive adhesive. To get the color, I add liquid pigments to the adhesive before curing it with ultra violet light. 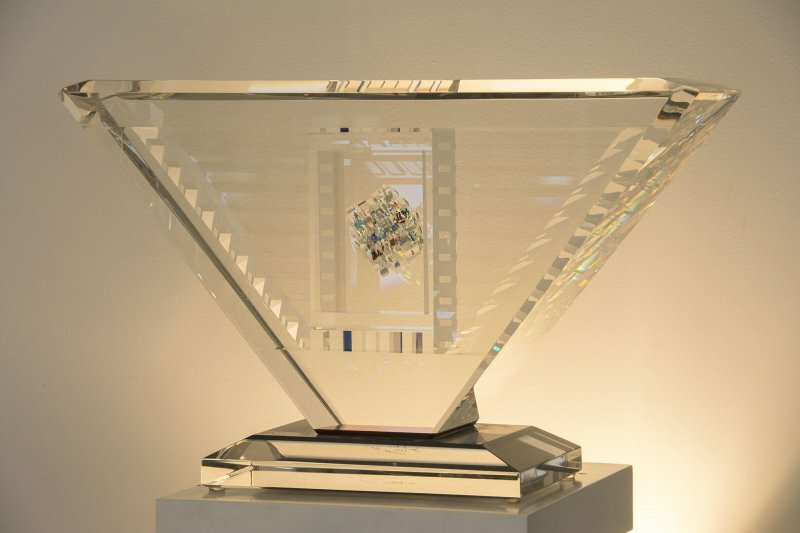 As technology and industrial glass processes have advanced over the years, I have been able to refine the way I work. So my work is really a combination of art and science. KH: You and I have both been in the glass world for many decades. What are your plans for the future? SH: I love making glass art and don’t ever really plan to retire. However, at some point I would like to move to the coast and do more fishing! KH: What are you most proud of in your career? 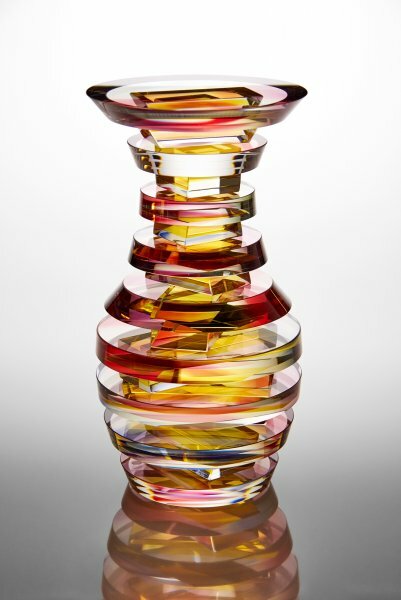 SH: I am very proud of having been able to sustain myself through my glass art for forty years. I am also proud of having work in the White House Collection, the Metropolitan Museum of Art, the Boston Museum of Fine Art and other museums and public collections. I also love it when someone sees my work for the first time and says, "I’ve never seen anything like this before." That’s a great feeling. KH: Tell me about your current museum exhibition. SH: I’m very excited about the 40-year retrospective of my work at the Sandwich Glass Museum out on Cape Cod. It includes 70 pieces, from my very earliest effort to my latest sculptures. (Sandwich Museum of Glass, Sandwich, MA. July 1-October 29). KH: What would you like to add to this interview? SH: I see my work as a continuous flow from the beginning through today. 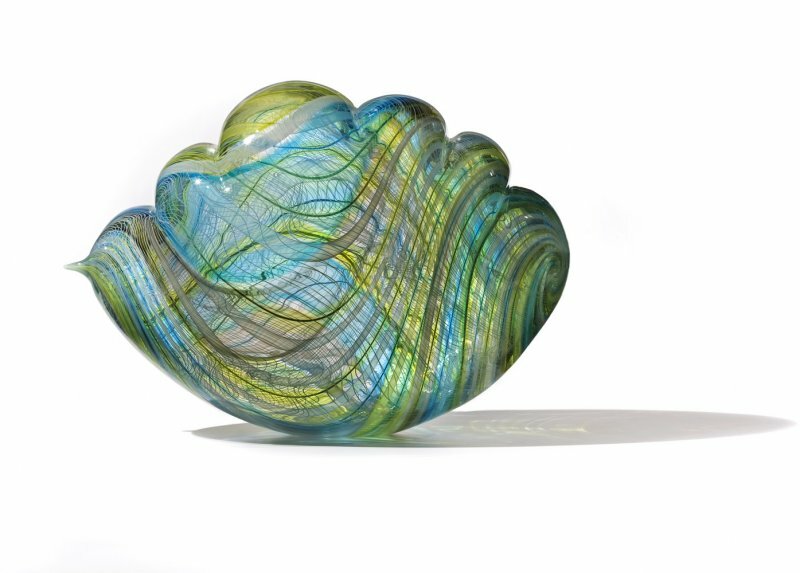 My work can be seen and talked about in three ways: As three-dimensional paintings in glass, as sculptural objects and as optically kinetic vessel forms. This beautiful Jon Kuhn piece has just become available on the secondary market. To view more secondary market works please click here. Lino’s "Riverstone" series is not typical of the maestro’s work. To begin with, it is not as translucent as most of his work, although with backlighting it has a nice glow. Secondly, this piece is more painterly than almost all of the maestro’s other series, with the exception of the flat panels he has been creating in recent years. Nonetheless, I find this series and this piece in particular to be extremely beautiful and artistic. 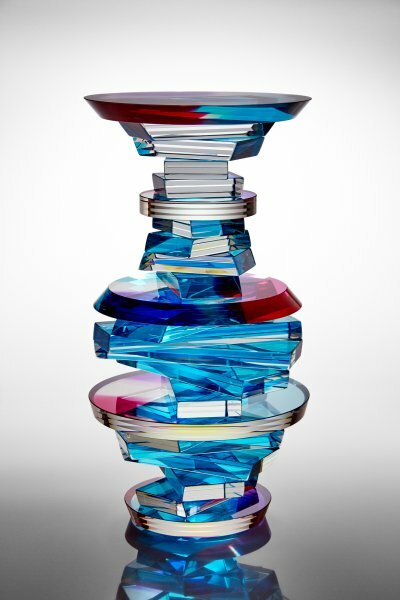 This sculptural glass piece by Ross Richmond has a wonderful serenity and dignity about it. I particularly love the amazing detail of the hands and the face. There is a presence here that is undeniable. 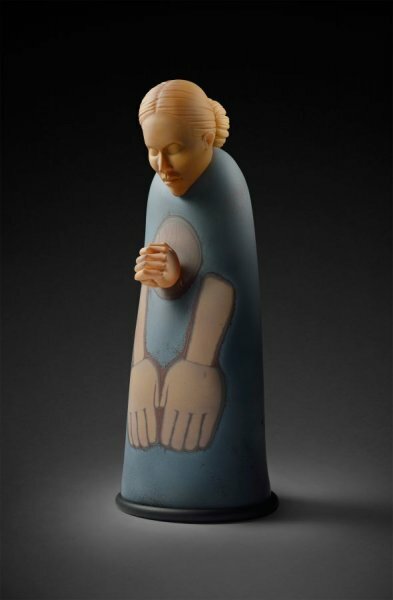 When I asked Nancy Callan for a new piece for this newsletter, she sent me two images to choose from. This was somewhat torturous for me as I love both pieces for totally different reasons. 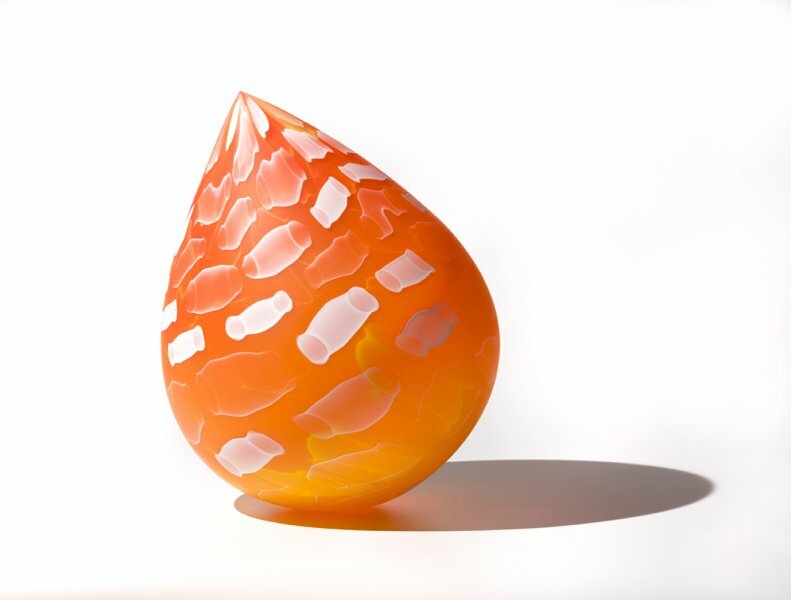 "Cascade Cloud" is so subtle in its color palate and so intricate in its cane work and "Papaya Droplet" is so, well, "wild" is the word that comes to mind. Or, as Nancy says more elegantly, this piece is so "bright and summery." In the end, I prevailed upon Nancy to allow me to feature both! Thank you for taking a few moments to enjoy this edition of Holsten Galleries News. I look forward to staying in touch!